Everyone knows the clocks at Flinders Street Station – but have you ever stood and taken a closer look at the arched leadlight window located above? The detail of the windows is best viewed from inside the station, looking back out. I first took a close look at the windows in August 2009, and noticed that four five of the the original leadlight panels had been replaced with plain glass. But by April 2010 they had been repaired. Which is easier to see in this photo from April 2012. But by June 2017 another pane of plain glass had reappeared. Scaffolding then covered the station. With the plain glass disappearing along with the scaffolding a few months later. Leaving the leadlight windows looking the best they ever have. So how many times have the windows been broken in the past, and is any of the glass original? 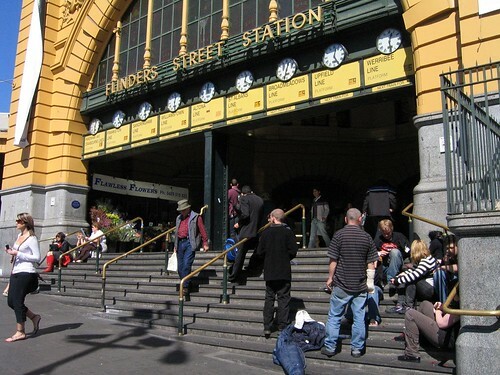 In July 2009 Neos Kosmos talked to Arthur Andronas, director of Andronas Conservation Architecture, who has been involved in earlier restoration works at Flinders Street Station. Over the past 25 years, we have had the opportunity to conserve a great number of historic buildings, including The Block Arcade, ANZAC House, Newman College at Melbourne University designed by Walter Burley Griffin (the man who designed Canberra) and the stained glass at Flinders Street Station (above the clocks). The plain panels in August 2009 might have been related to a protest a few months earlier when projectiles were thrown at the window. This story doesn’t specifically say any panels were broken, but my recollection is that a couple were. Thanks for the link – there can’t be too many events that would lead to broken windows there. Funny, I remember the the protesters who occupied the intersection and broke three of the windows as as Indian born taxi drivers. I must just be wrong. I was very cross about it at the time. I have a photo from January 2008 showing just one plain pane, the right bottom one of the 2nd of the 7 sections, looking from inside as with your photos. That one is also plain glass in your photo from August 2009. I’d say that’s consistent with 3 more being broken at the above mentioned demonstration, except I count 5 plain panes in your photo. Maybe it’s sun glare. I’ve just had a closer look, and it is five plain panes. The lack of frosted glass isn’t the only spotting feature – the overall pattern covers every pane, so the lack of it means the glass is plain.